There are different demands on ​you when you perform and when ​you practice. So your mindset needs to be different too. And ​you want to be able to access that mindset easily whenever ​you perform. But you probably spend much more time practicing than performing. You assume that when you want to “just wail”, it will be easy. When it comes to that moment, though, you’re confused to find yourself still trapped in your practice mindset. You don’t fully realise that you need to develop and nurture BOTH mindsets. You need to work on that performance mindset so it’s available when you want it. Without this awareness, the imbalance between practice and performance time results in ​you continually strengthening your practice mindset at the expense of ​your performance mindset. Pouring all your energy and focus into efficient practice gives you observable progress in the practice room. Everything seems to be going brilliantly. 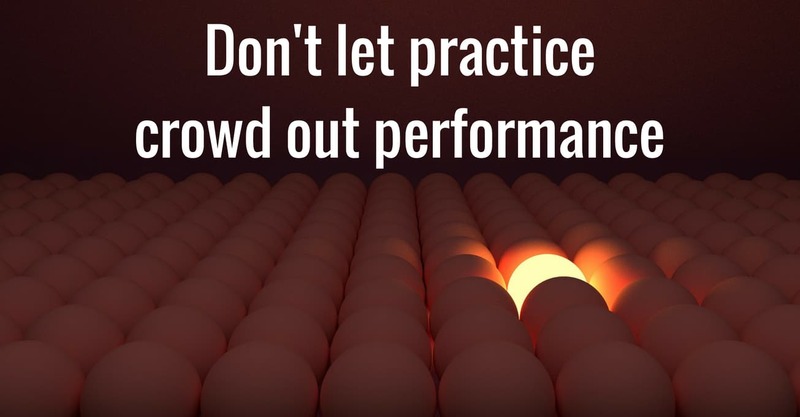 Right up to the point where you get on stage to perform and fall well short of your potential because you simply don’t have access to that performance mindset. Maybe you blame lack of sufficient practice as the problem. Or maybe you don’t even realise how much we’re selling yourself short and think that your performance is just inevitably going to be at a lower level than your practice. Either way you head back to the practice room and throw yourself back into the practice mindset. You don’t realise that this is the very thing holding you back. Lack of a great performance mindset can also reduce your enjoyment of performance, subtly nudging you to practice more and perform less in the future. The cycle keeps going round and reinforcing itself. What does an ideal performance mindset/state look like? Your ideal performance mindset should be more about the big picture than the little details. It’s about conceiving the music that you want to create really clearly and vividly in your mind. Your focus is always on what you’re doing RIGHT NOW to realise that conception fully. It’s not about noticing what’s gone wrong (or even what’s gone right). It’s definitely not about analysing what’s just happened. That’s really useful after the fact, but it’s positively unhelpful during the performance. Yes, you do need to listen to what you’re playing as you perform. But it’s the conceiving part that’s more important than the listening part. And the listening is purely for feedback, not for analysis or judgement. If the thought of not analysing what you play in real time bothers you, then I suggest you make a habit of recording your performances. That allows you to go back later and analyse to your heart’s content. It’s also not about carefully controlling all of your physical movements. The thought of it might even make you feel uncomfortable. It’s very common for conscientious musicians to get used to operating in a practice mindset. It tends to become their comfort zone. In order to redress the balance, you’re going to have to spend a fair bit of practice time deliberately heading the other way. Choose a piece to play, get ready, and launch into it aiming to adopt a performance mindset. Hear what you want to play clearly in your mind before you play it – don’t analyse what you’ve just played. Think of the bigger picture you’re looking to communicate – don’t worry about the little details. It will feel strange at first. To start with, you may well find that you frequently fail to achieve this mindset at all. And you’ll almost certainly find yourself regularly slipping back into an analysing, detail-focused, practice mindset despite your best intention to stay with a performance mindset. If you stick with it, though, you’ll make progress. The more time you spend working on it, the stronger your connection to this state will get. And, in a real performance situation, there will probably be temptations to veer towards the practice mindset. When the stakes are high​, we want to be able to control the little details. To judge how well we’re playing. To avoid mistakes. A great way to improve this is to use a pre-performance routine to help you access your ideal performance state. You can build in aspects to the routine that help you achieve that performance mindset. There’s a further hook, though. As you repeatedly practice using the routine to access your performance mindset you’ll start to associate the two things. Over time, going through the routine will, in itself, help you to achieve your desired performance state. We’ve seen that your performance mindset and your practice mindset should be two different things. Unless you’re performing as much as you practice, though, the chances are that you’re unwittingly biasing yourself towards adopting a practice mindset all the time. Developing a strong performance mindset and learning to access it can make a massive difference to how well you perform. It will take time to get it working, though. It can also be a constant battle to stay with that mindset as you play, and to resist the temptation to go back to analysing and judging. Ultimately, this is not something that you ever “finish”. Like all the most rewarding things, you can carry on deepening your understanding and skill indefinitely. But the benefits are huge – each step you take along the way will increase both the level of your performance and your enjoyment of the performing experience. Do you have a clear separation between your practice and performance mindsets? Let me know in the comments below. One step I have taken to try and differentiate practice and performance mindset is by using designated rooms at home for each. For creating, learning and practising I am in my lounge and for performance mindset I am in another room where I am set up with a mic and amp as if performing live….I am not actually performing live yet on my own, which is my goal, but this is helping me build up to that and to develop a procedure for getting into the performance mindset as a habit….. Thanks for sharing that, Annie. Sounds like a great way to mark the difference between the two states. How are you splitting your time between the two? Is it mostly “practice”, or are you managing to do a good chunk in performance mode? At practice, or rehearsal, I focus on the small stuff. Every note perfect, every part rehearsed over and over until I can’t get it wrong. In performance, I simply play my music. If I miss a note, or make a mistake oh well, I play through it. If the other guys do the same , I don’t get angry, we play through it. I found out that if you dwell on little things during performance, you’ll lose track and stumble even worse. It’s all for the show! Thanks for the comment, Steven. And it sounds like you’re going about things in exactly the right way! Do you find it easy to “simply play your music” in performance, though? I know a lot of musicians (myself included occasionally) go in with that intention but then find themselves getting sucked into dwelling on the little things. That’s where working on getting into a performance mindset can be important work.